The Woburn City Council is the legislative body of the City of Woburn. There are nine members of the City Council. The city is divided into seven wards. Each ward is represented by a Ward Alderman elected by the residents of the ward. There are two Aldermen At Large elected by the residents of the entire city. Each Alderman and Alderman At Large has one vote on all matters before the City Council. The Aldermen are elected on the first Tuesday in November in odd-numbered years. All Alderman seats are open for election every two years.They take office on the first Monday in January of the following year. The President of the City Council is elected by and from the members at the organizational meeting in January and serves for two years in that position. 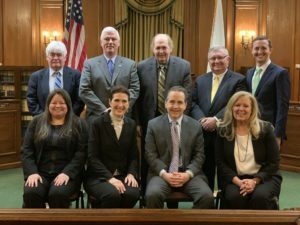 The City Council meets on the first and third Tuesday of each month at 7 p.m. in the Council Chamber in Woburn City Hall at 10 Common Street, except for July and August when there is generally one meeting per month. Committees meet as needed and generally meet on Monday nights.